If you are not familiar with the names I am referring to, here is a brief idea. Both Google Panda updates and Google Penguin updates refer to algorithm changes at the Google Web Search system. These are series of changes made to the way how Google rank websites and show them in search results. There are quite a few differences between the Panda updates and Penguin updates, but they both are meant to cleanup the Google search results. The primary difference between Panda updates and Penguin updates is, Panda update were meant to penalize low quality websites and Penguin updates are meant to promote high quality sites while penalizing spammy sites. If you closely compare the Panda updates and Penguin updates, you will see that both are meant to cleanup the search results and nothing else. Even though Panda deal with low quality sites and Penguin deals with spammy sites, both are essentially same in most cases. Typically, spammy sites have low quality content or thin content. But they use keyword stuffing and cloaking to cheat Google. Both Panda and Penguin penalize the sites that are involved in unethical SEO practices like spammy link building, excessive link exchange etc. 1. Sites that list hundreds of phone numbers with the intention of getting traffic for any of the phone numbers listed in the page. 2. Sites that use spinned articles and auto generated content with almost no value addition. The Penguin updates specifically penalize such sites and reduce their search engine ranking. Even though Penguin updates are targeted to penalize only sites that are involved in web spam, the webmaster forums are flooded with complaints about incorrect judgement of sites by this update. Many webmasters and bloggers report that the new updates have penalized genuine and original content while many spam websites still rank high in search results. Panda Updates where first rolled out on Feb 23, 2011. After that, a series of updates were announced by Google and the last one was Panda 3.5, rolled out in April 2012. Each of the Panda updates affected about 3% of the search queries and hundreds of blogs and low quality websites where kicked out of Google search results. Google Penguin updates came up as a surprise to most webmasters when it was announced on 24 April 2012. 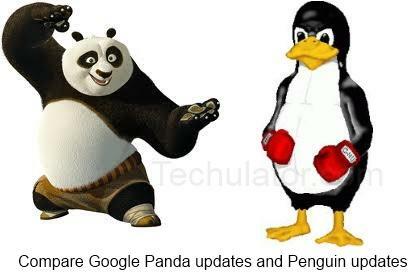 In fact, Google did not declare a name for the updates when the official announcement of Penguin updates were made. Later, after seeing a lot of complaints in the webmaster forums and blogs, Google decided to open a Feedback Form and mentioned the name "Penguin updates" in their twitter posts. Google Panda Updates involve the new algorithm which was introduced in February 2011 which enhanced the search by eliminating the low quality search. This literally upscaled Googles search manifold. The recent update about the Google Panda algorithm been updated catering to 1.6 percent of the demand shows its huge demand.Google Panda is definitely more powerful and efficient as far as search technology is concerned.